An aerobic walk is one that is long enough and brisk enough to bring your heart rate up into the aerobic heart rate zone and keep it there for 30 to 50 minutes. This is a higher heart rate, between moderate and vigorous intensity. You will be walking very fast, breathing very hard and sweating. You will need to set aside 45 minutes to an hour for this walk so you can include a warm-up, stretching, and a cooldown. You can do this walking workout every other day. On the days in between, do the health walk or the fat-burning walk or enjoy a weight training workout instead. This allows the body time to replenish its energy stores and to incorporate the benefits of the workout. You can do this walk outside or inside on the treadmill or an indoor walking track. You will want to find a course where you can walk fast without many interruptions for street crossings, etc. For a fast walking pace to bring your heart rate up into the aerobic zone, you will need flexible running shoes. You'll want to wear clothes that give you freedom of motion and that can wick away sweat. Because you will be sweating, you will need to carry water or have it available every 20 minutes to replenish yourself. Start at an easy pace for 5-10 minutes. Stop and do a stretching and flexibility routine for 5 minutes. Continue, walking at a pace that brings your heart rate up to 70-80% of your maximum heart rate (MHR). This is a quick pace where you are breathing hard and able to speak in short sentences. Walk for 30-50 minutes at this pace. Cool down with 5-10 minutes at an easy pace. End with 5 minutes of gentle stretching and flexibility exercises. This walking workout improves your aerobic fitness so you will able to exercise more vigorously and for a longer duration. It increases the number and size of blood vessels in the muscles and builds your lung power. At this exercise intensity, 50% of your calories burned are fats, 1% are proteins and 50% are carbohydrates. The aerobic phase of your workout should be 50 minutes or less to prevent the build-up of lactic acid. If you want to workout longer than an hour, it's best to slow your pace a bit for the rest of your walk. You will need to walk briskly to raise your heart rate up to 70% of maximum heart rate. 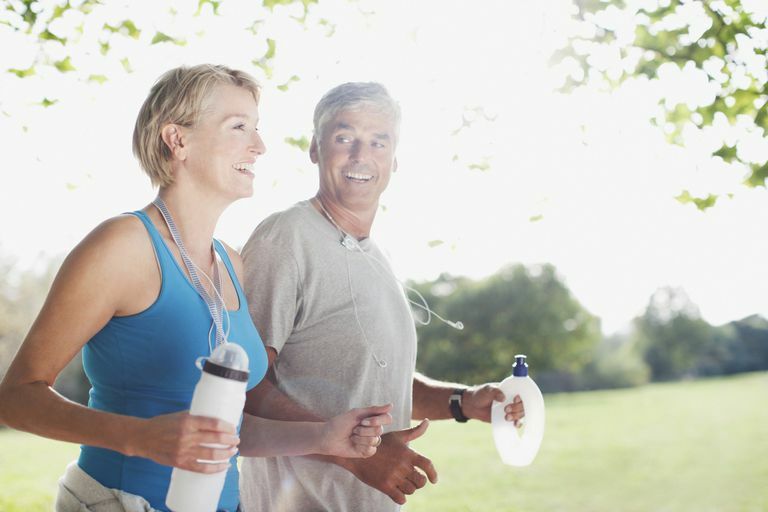 Use our tips for how to walk faster to make your walking more vigorous. On a treadmill, increasing the incline will raise your heart rate so you can get that benefit at slower speeds. Outdoors, finding a route that has hills and stairs is one solution, although your heart rate may recover on the downhills. Adding fitness walking poles can also raise your heart rate. If you are already a fit person, you may not be able to easily get your heart rate up to 70% of maximum heart rate by walking. You may want to add running intervals to your walking workout to keep your heart rate high.